One of the great things about asparagus is once you have the plants established it just keeps coming back each year. The only negative is that you really can’t start harvesting it until the third year. So for an asparagus lover those three years seem like an eternity. I had grown asparagus for about 7 years at my pervious house and now that we have moved, it’s time to start all over again. 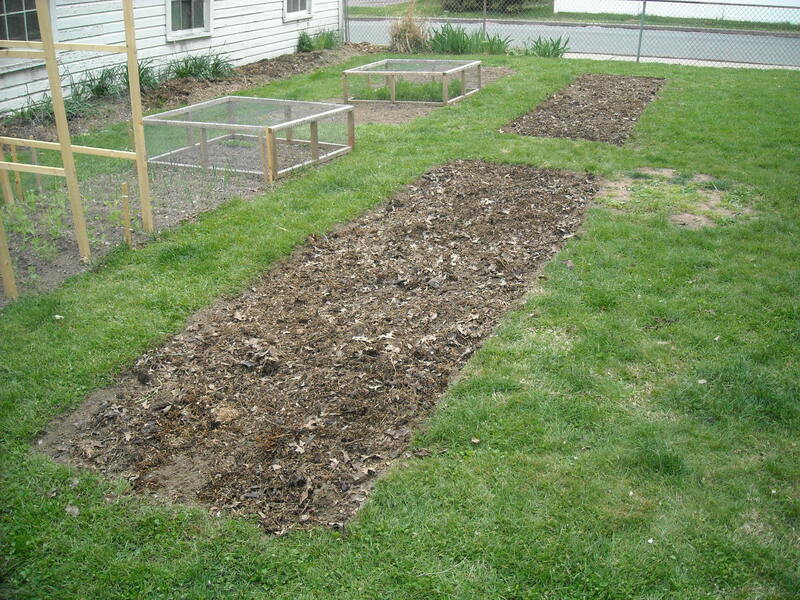 Since asparagus is a perennial vegetable, I decided not to plant it in my standard vegetable beds. Instead I decided to plant it in an old flower bed along one of my buildings. Even though it is along the building, the bed gets really good sunlight in the morning and late afternoon. 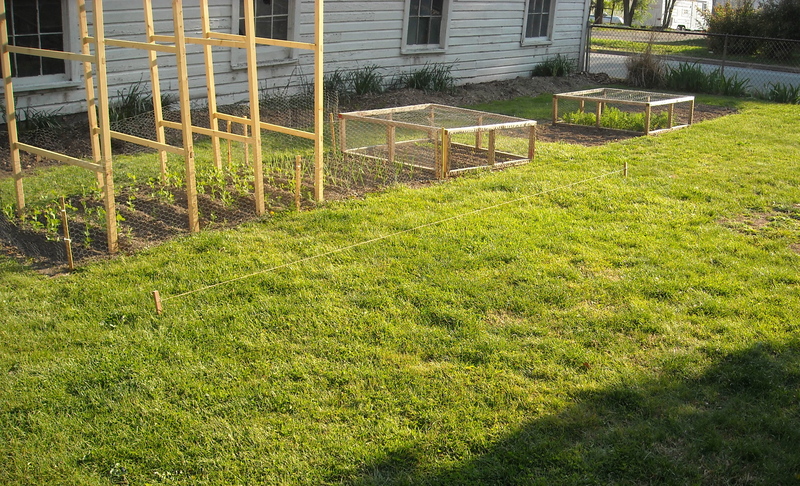 This seems like a great spot to try growing asparagus. 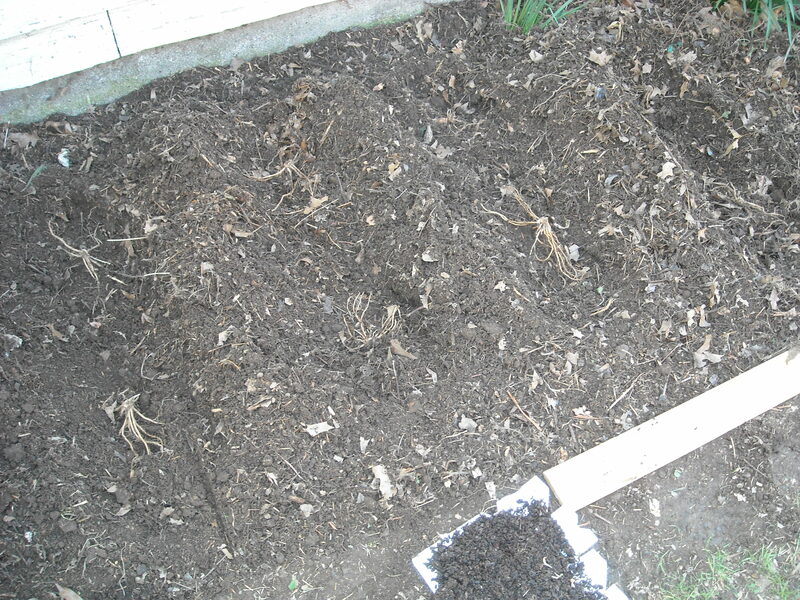 Last fall I had applied a thick layer of shredded leaves to the bed. 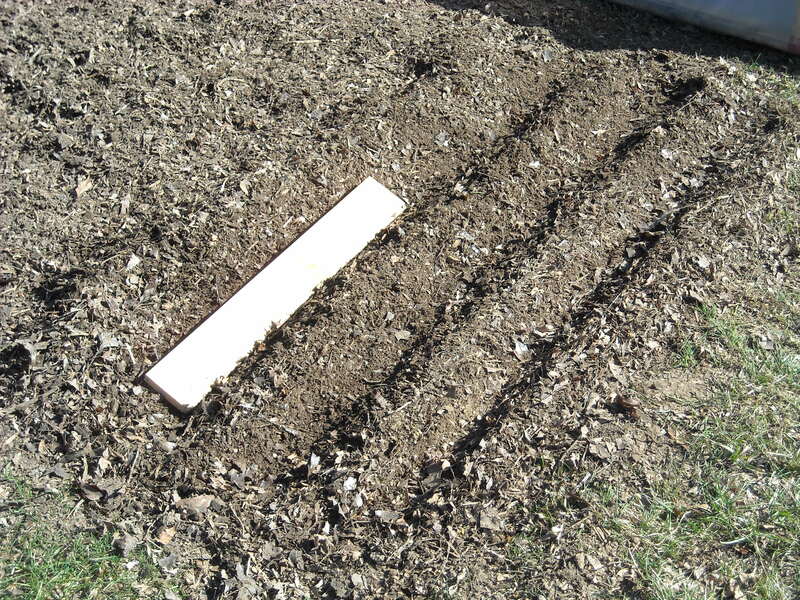 So before I planted the asparagus, I turned over the soil in the bed several times and ran the small rototiller through it to make sure the soil was good and loose. I purchased 8 Mary Washington crowns from our local hardware/garden supply store. I dug 4 long ditches (about 6 inches deep) and placed two crowns in each ditch and spaced the crowns 18 inches apart. Asparagus crowns in the bed. 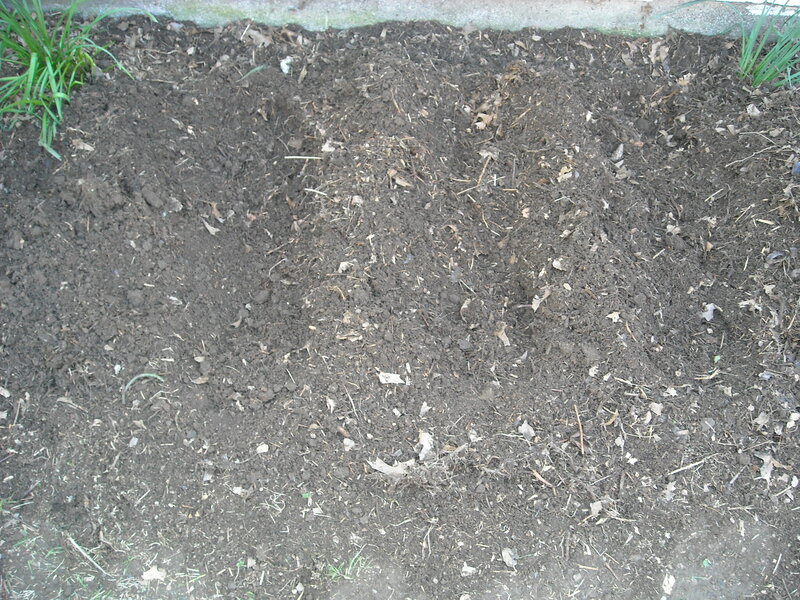 I then covered all the crowns with about 3 inches of soil. 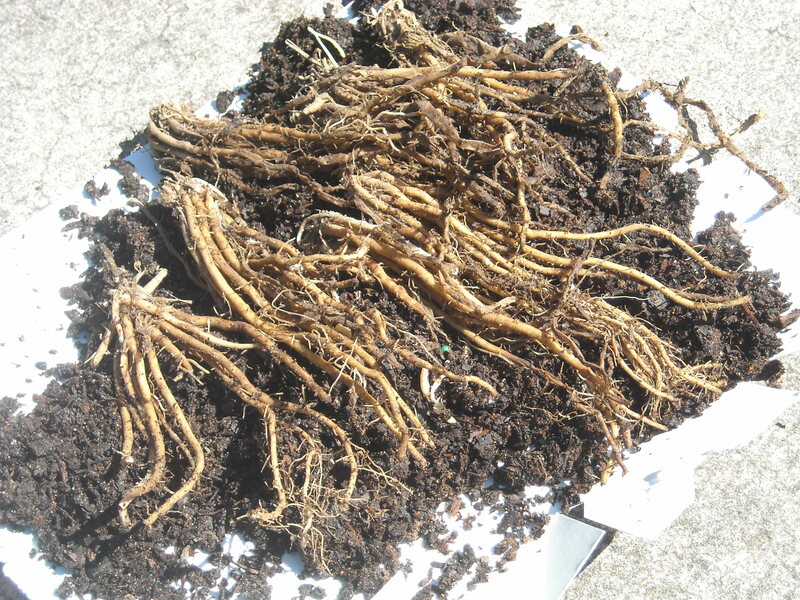 In a few weeks when the asparagus begins to sprout I will apply another 3 inches of soil over top the plants. Now with the asparagus planted the only thing left to do is sit back and wait three long years. I guess all great things take time. Spring is in the air and the garden is starting to show signs of life. All the pea seeds have germinated and the seedlings are growing well. 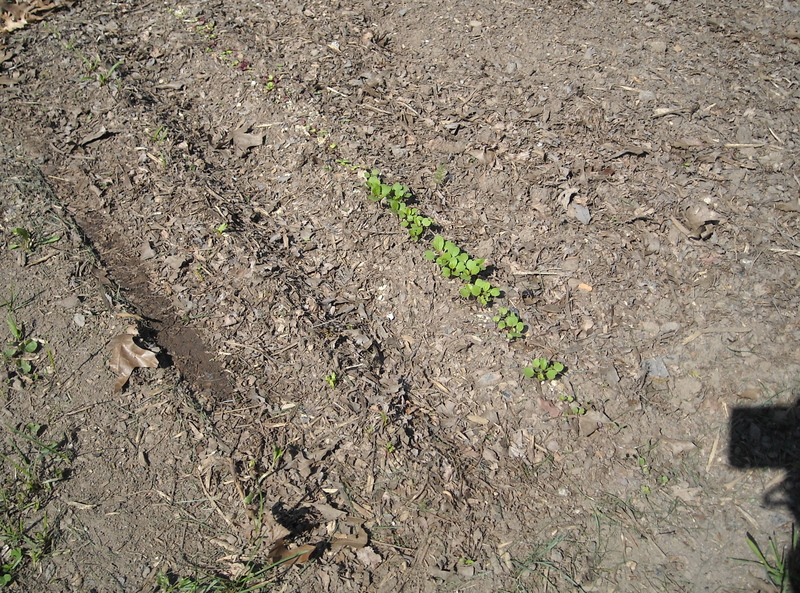 The arugula is off to a strong start but the lettuce, swiss chard, and spinach are not far off. Plants from my late fall planting. 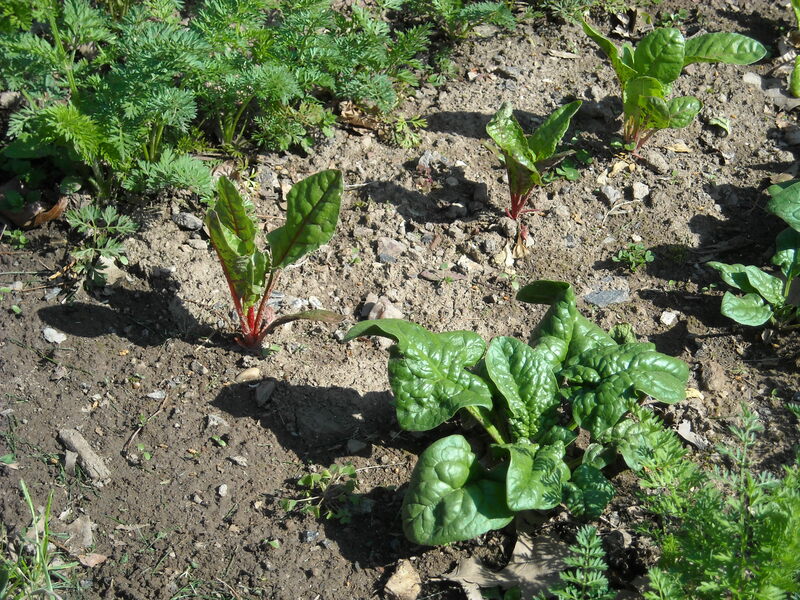 The carrots, swiss chard, and spinach that I planted late last fall and over wintered under the cold frame have started to grow again and should give us an early spring harvest. The year is off to a great start here at The Year Round Harvest. It’s been two weeks since I started my seeds and all but a few seem to have germinated really well. The only seeds that have not germinated yet are one of the varieties of bell pepper (maybe old seeds) and the Greek oregano (which seems to be really slow to germinate). I have been keeping the seedlings under lights for about 14 hours a day. I usually water the seedlings in the early morning and the late afternoon. Several days ago in order to keep the seed starting mix damp all day, I had to switch from just misting the seedlings to watering and misting the seedlings. 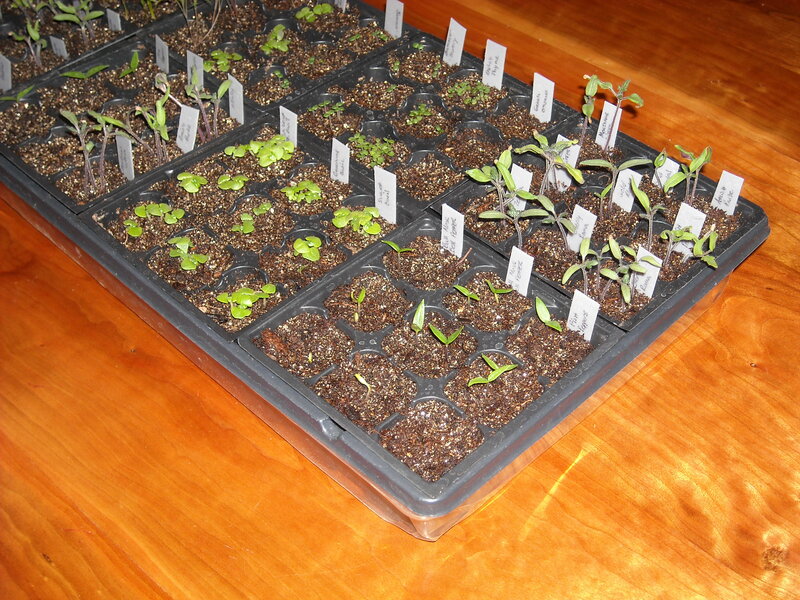 In a few days I will thin out some of the seedlings, keeping the plants that seem to be the strongest. I will also have to transplant my tomatoes soon to small pots. I will post more on my tomato transplant process. I began growing my own plants from seeds several years ago when I became frustrated with the selection of plants that were available at the greenhouses. 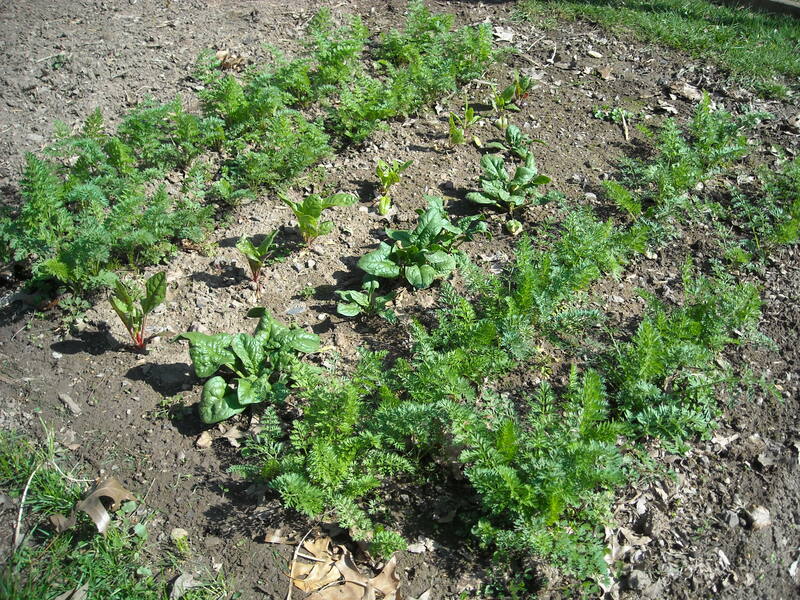 Over the years I have had good success with starting a wide variety of herbs and vegetables. The following is the process that I use. 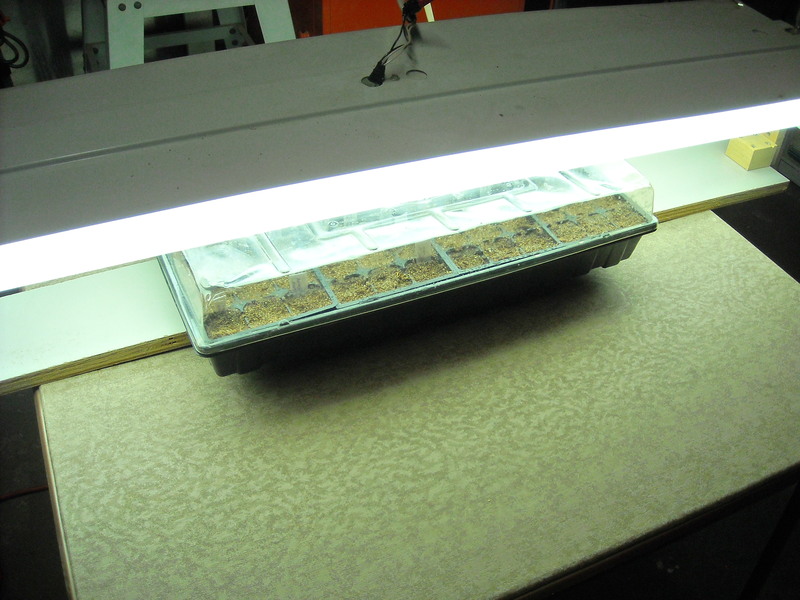 – Standard fluorescent shop lights with some way to adjust the height above the seed starting trays. – Last but not least the seeds, the following is the list of the seeds that I started this year. -Herbs: Dill, Cilantro, Summer Savory, Genovese Basil, Sweet Basil, Large Leaf Italian Basil, English Thyme, and Greek Oregano. 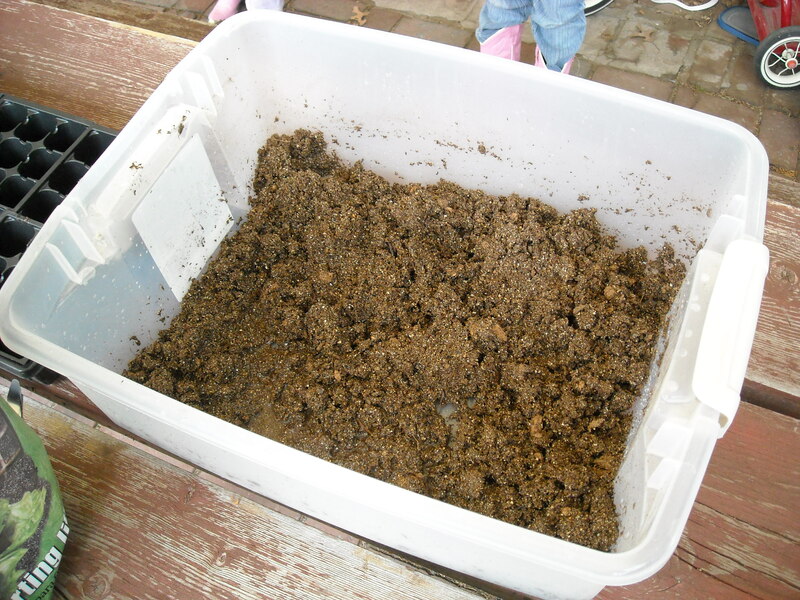 The first step in my process is to fill a tub with seed starting mix (the approximate amount I need to fill the cells) then I add water to the mix until the mix is really saturated. The next step in the process is to fill all of the tray cells with the seed starting mix. I fill each cell about 3/4 full with the mix. Then I make plant markers to label what plant is growing in each cell. 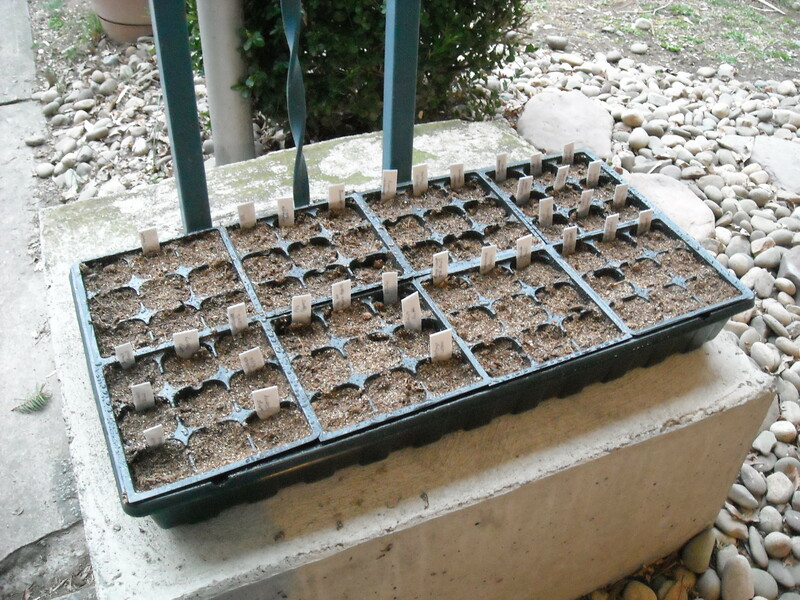 I put the plant markers in first so that I don’t forget what seeds were planted in each cell when I am all done. Once all of the plant markers are in place, I begin placing a few seeds of the variety in each cell to ensure germination in each cell. After the seeds sprout, I will go through and thin out the seedlings in each cell. After all the seeds have been placed in the appropriate cells, I take some dry seed starting mix and cover up all the seeds so the seeds are the correct depth. Then I take a spray bottle filled with water and mist the top of all the cells. The last step in the process is to cover the tray with the clear plastic lid and place it under the lights. I use a standard 4 bulb fluorescent shop light, with standard bulbs. I have used this light system for the last 5 years with great results. My light hangs from a simple stand that gives me the ability to adjust the height of the lights as the plants grow. I usually keep the light only a few inches above the seed trays to start. 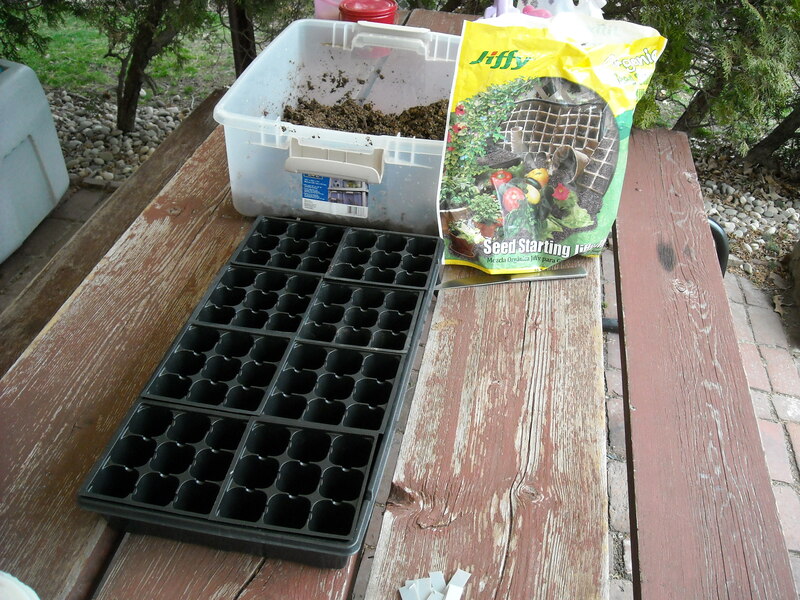 I leave the clear plastic cover on until the first seeds start to germinate and push through the mix. Not all the seeds will germinate at the same time, so I make sure the cover is removed once the first seedlings push through. Once the cover is removed it is important to make sure that the seedlings are kept moist. I use a spray bottle filled with water to mist the seedlings. I will keep you posted on the progress of my plants. With a warmer than normal week of weather forecasted, I decide to plant my peas and onions a week ahead of my typical planting schedule. Yellow, red, and white onion sets ready for planting. I always purchase my onion sets from our local hardware store, they have a great selection. Planting the onion sets is a pretty simple process. First I create mounds of dirt for each row then I work my way down each row pushing the onion set down until they are completely covered. 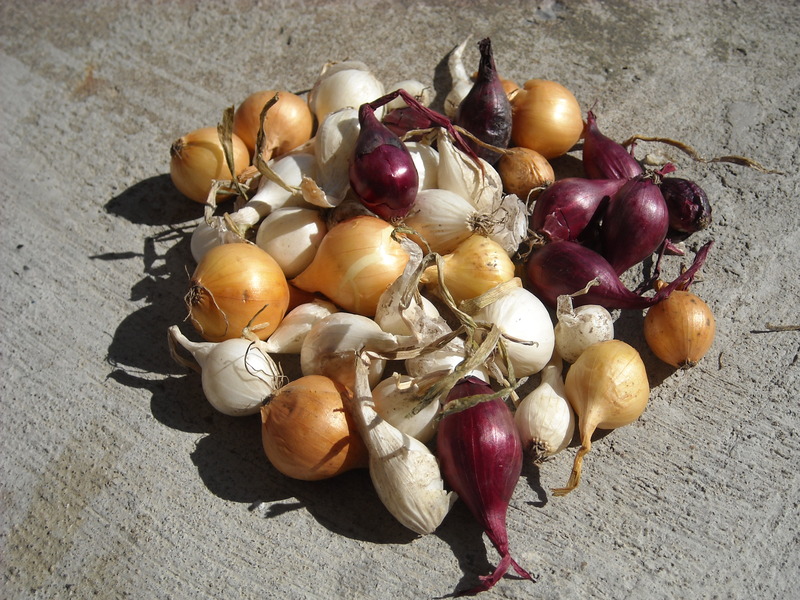 I plant my onion sets pretty close together, then in the late spring I will pick a few of them for spring onions, I pick every other one or so to allow more space for plants that will grow into large onions. Sugar snap pea seeds that I have saved from previous seasons. Next thing on the schedule to plant is sugar snap peas. 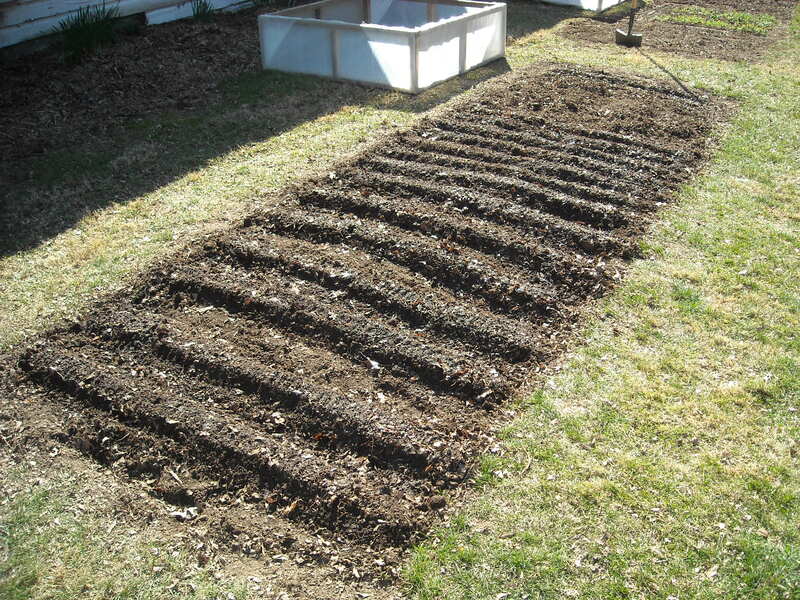 When planting sugar snap peas I create mounds for each row, then I create a little valley in each row. 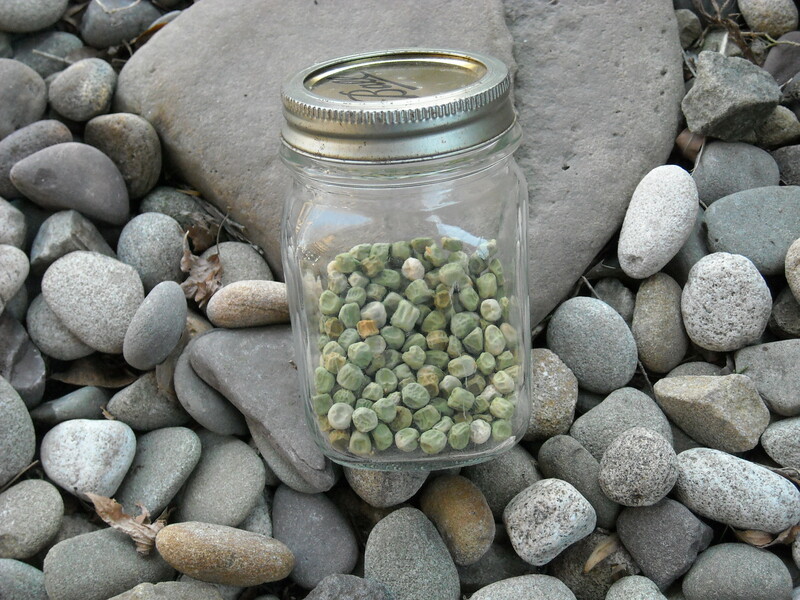 I place the pea seeds in the valley then using a rake pull some soil back over the valley to cover up the seeds. 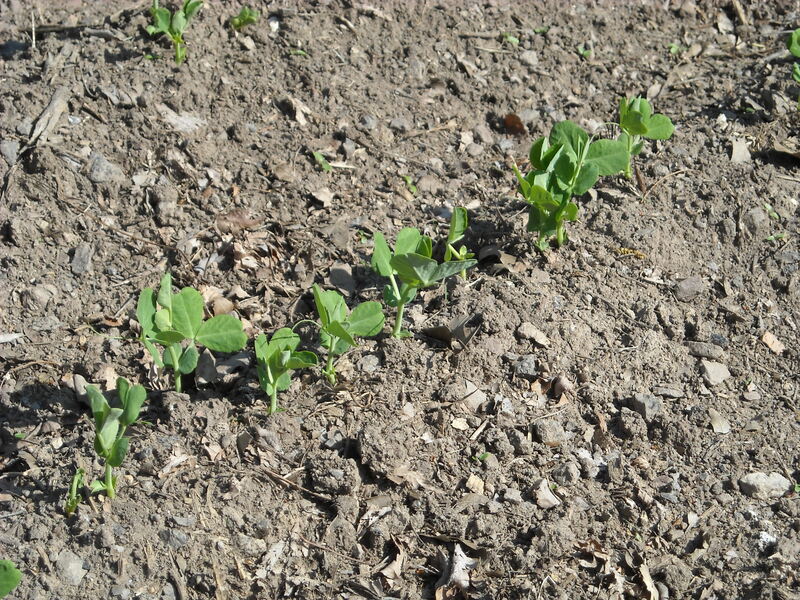 One thing I always keep in mind when I am planting sugar snap peas is where and how I am going to support the plants. I have had this variety grow to about 6 ft. tall, it takes a lot of support to keep the plants up. I try to keep in mind how much space the support system will take up, allowing enough space between my rows. Once I was completely done with all my planting I watered all my freshly planted seeds and sets. Another great day spent in the garden. 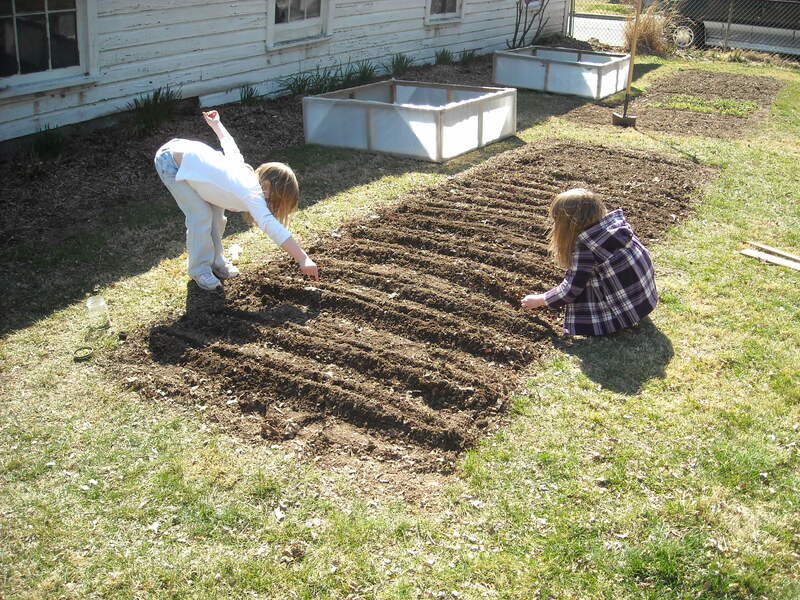 With the days getting longer and the weather getting warmer it was time to begin planting. 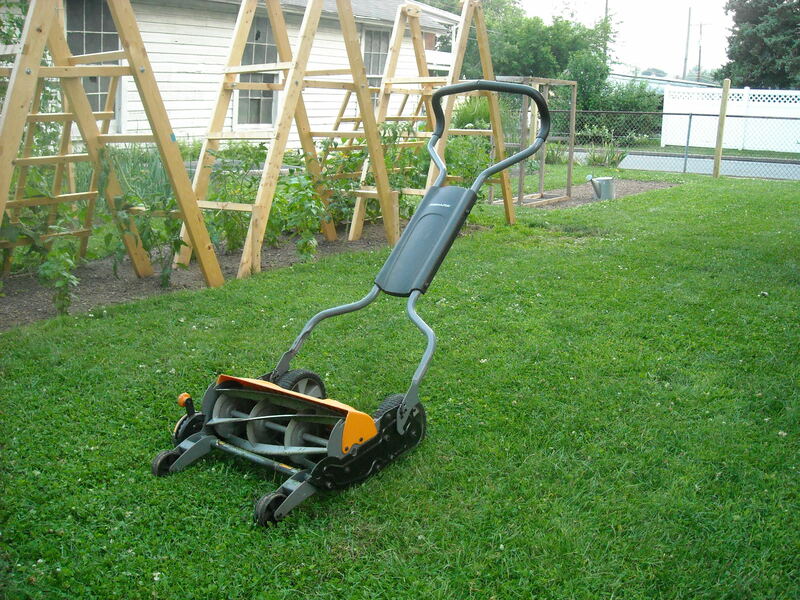 Last fall I had covered both of the garden beds with shredded leaves, so before I began planting I ran a small rototiller through each of garden beds several times to make sure that any of leftover leaves were well incorporated. 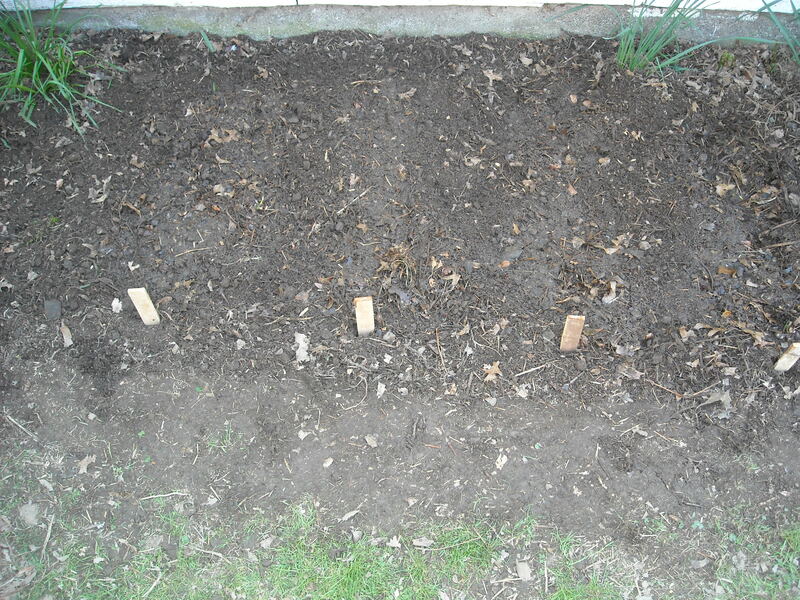 In two weeks I will plant more lettuce, spinach, and swiss chard. The idea is to spread out the planting in order to spread out the harvest. 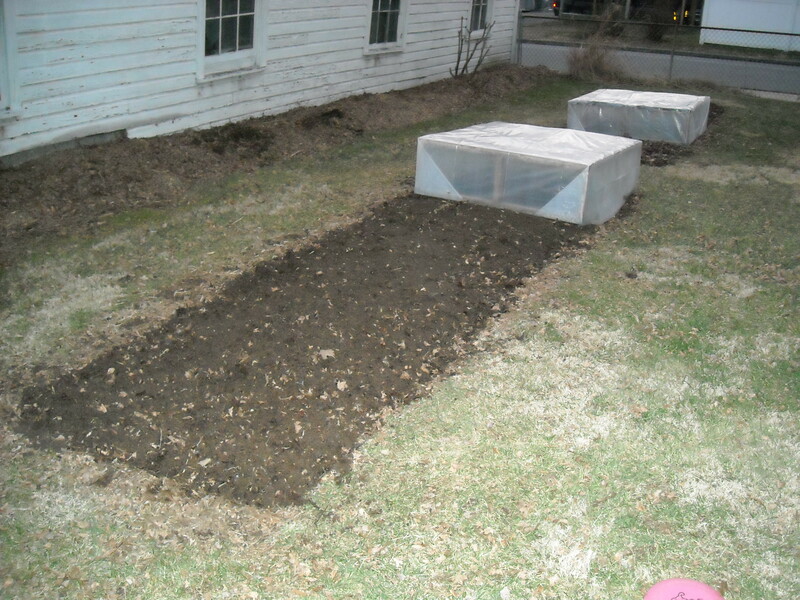 Once all the seeds were planted I covered the newly planted area with a homemade clear plastic cold frame. 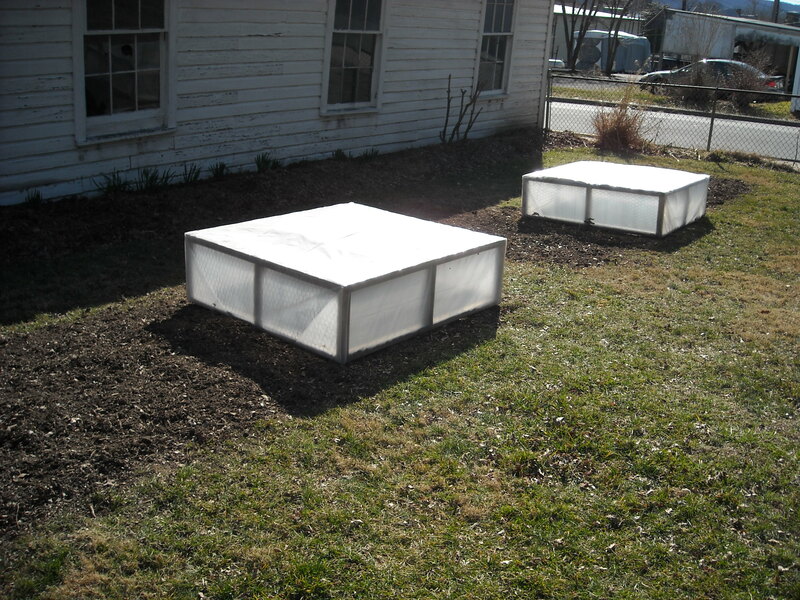 In central Pennsylvania we still have some very cold days and nights, the cold frames add an extra layer of protection. 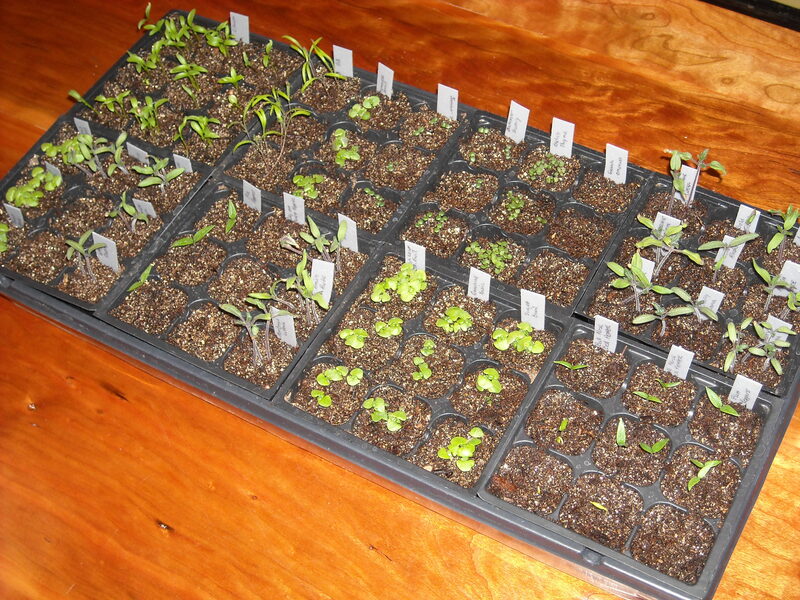 I have had good success with using cold frames in the past to get an early start on the planting season. 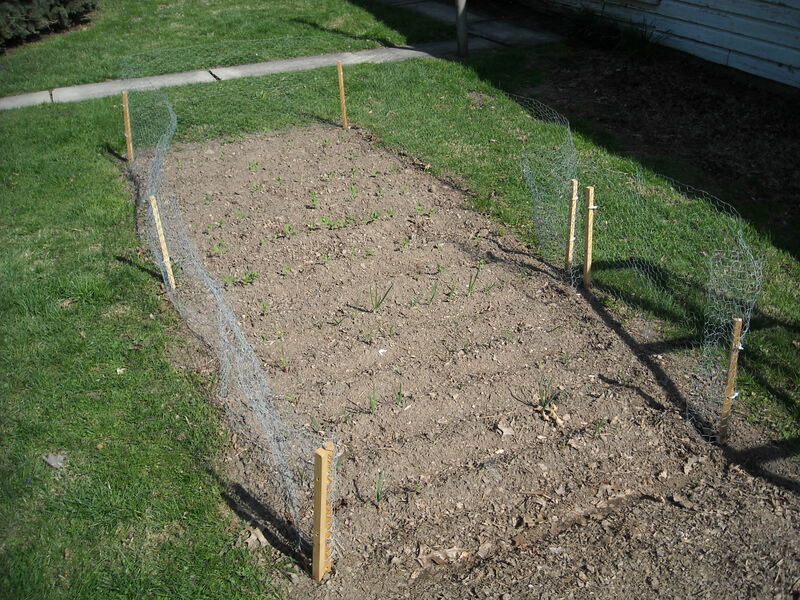 In case you were wondering in the far cold frame are carrots, spinach, and swiss chard that I planted late last fall. All the plants survived the winter under the cold frame. Now I will have a head start on the spring growing season. I can’t wait until the first harvest. We had our first day in the mid 50’s° F of the year and it is only January, that’s pretty rare in central Pennsylvania. 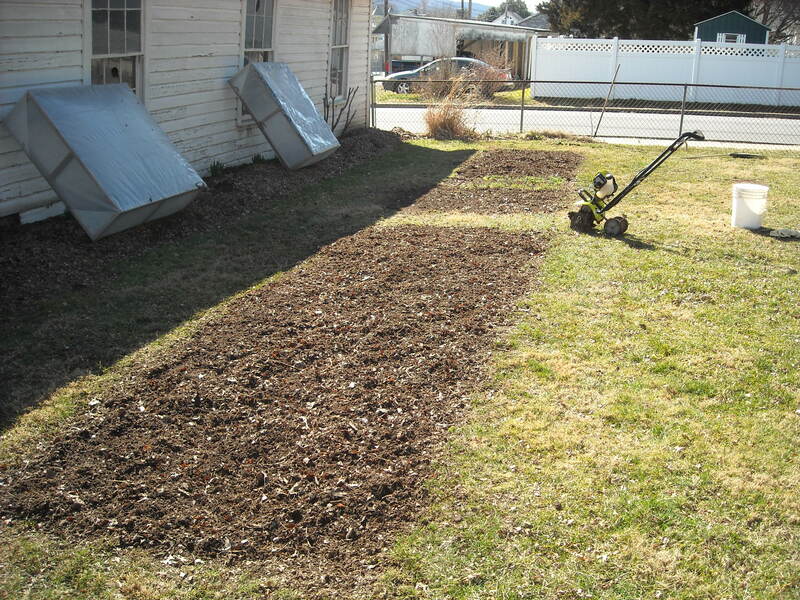 So I decide to take full advantage of the nice weather and get some early garden work done. 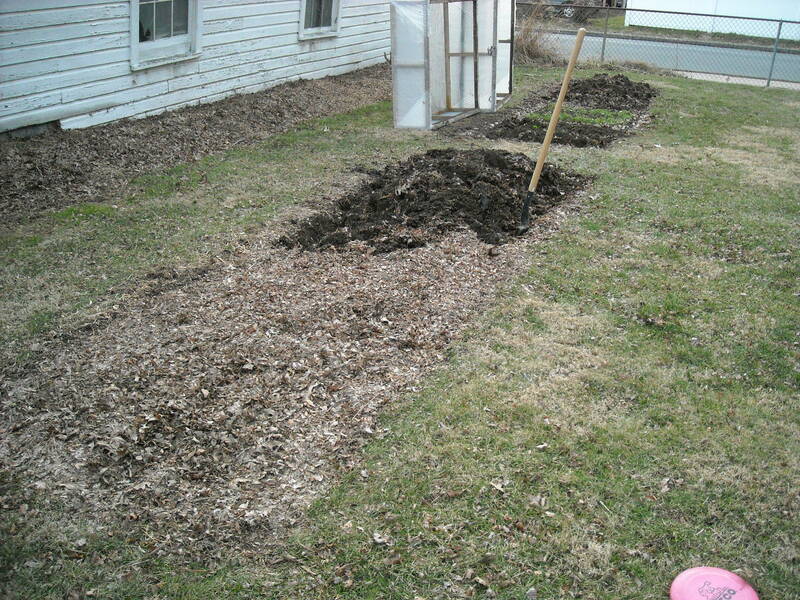 The job at hand, the shredded leaves I put on the garden in the fall needed turned into the soil. 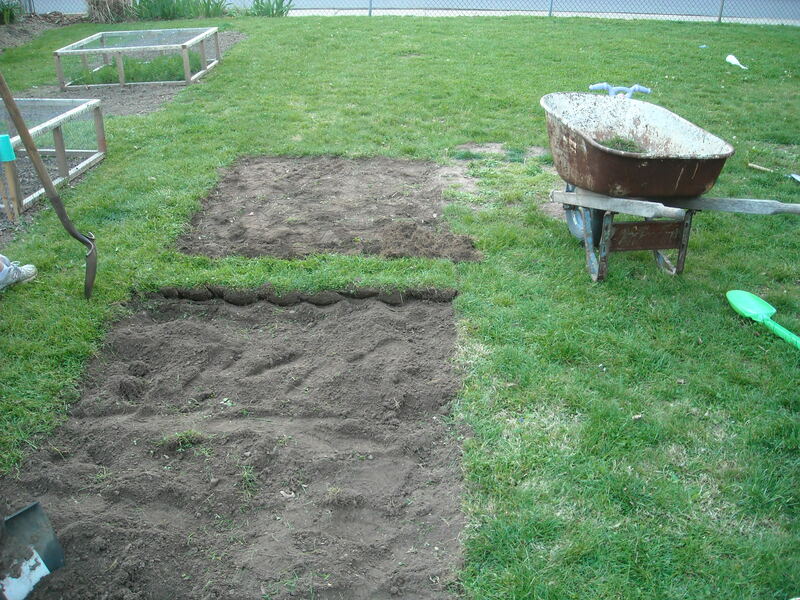 I just worked my way down each bed turning the soil over with the shovel. 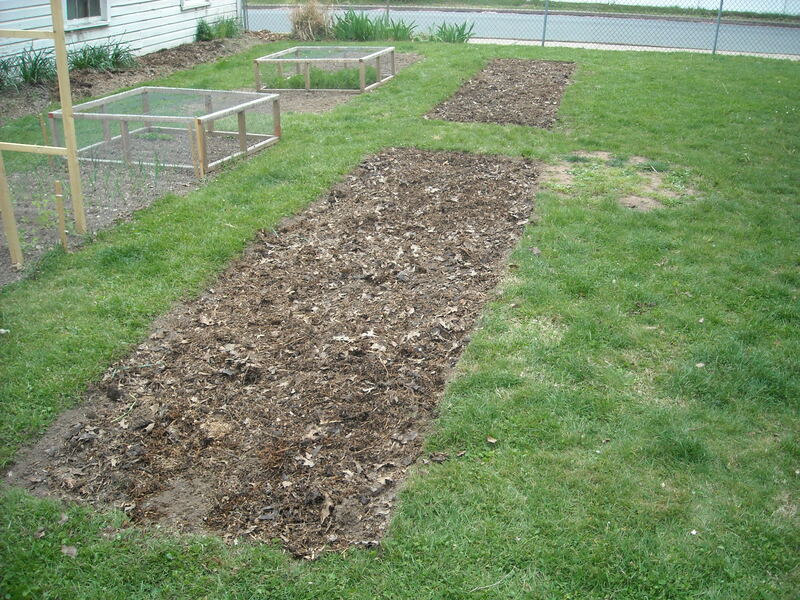 Once I had all the soil turned over I went back over each bed with a rake and leveled out the soil. First garden task of the year, complete. Only a few more weeks until planting starts.